Our friends at Spectrasonics are pleased to announce an “AAX Public Beta” version of the company’s three popular virtual instruments, Omnisphere, Trilian and Stylus RMX for Avid’s new Pro Tools™ 11. Registered users of the Spectrasonics instruments can log into their user accounts to download the Public Beta versions. The new versions are available at no charge to registered users to test with the new 64-bit version of Pro Tools. Omnisphere, Trilian and Stylus RMX are all native 64-bit software instruments designed to work with Pro Tools 11 on both OS X and Windows. The Award-winning Omnisphere Power Synth is Spectrasonics’ flagship instrument, featuring a hybrid architecture of high-resolution streaming samples as well as an extensive, fully programmable semi-modular synthesizer, which can be combined for thick, layered patches. Omnisphere ships with over 8,000 sounds. The Trilian Total Bass Module instrument is built on the same STEAM Engine technology as Omnisphere with immense flexibility in programming, while offering a vast selection of patches for Acoustic, Electric and Synth Basses. Stylus RMX, the Realtime Groove Module, is Spectrasonics loop-based plug-in for creating rhythm parts powered with the Spectrasonics Advanced Groove Engine (S.A.G.E.™) and featuring REX file compatibility for importing loops for unlimited library expansion. All three Spectrasonics instruments already work well in previous versions of Pro Tools as RTAS platform plug-ins. 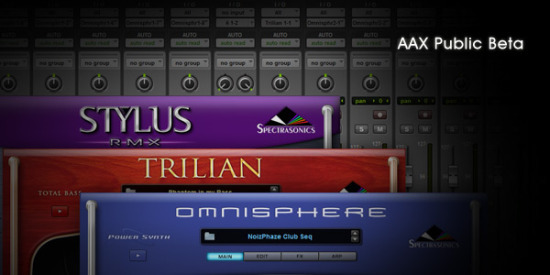 Registered users of Spectrasonics 64-bit Omnisphere, Trilian and Stylus RMX and Pro Tools version 11 can log into their user accounts to download the AAX Public Beta software in the Updates area.